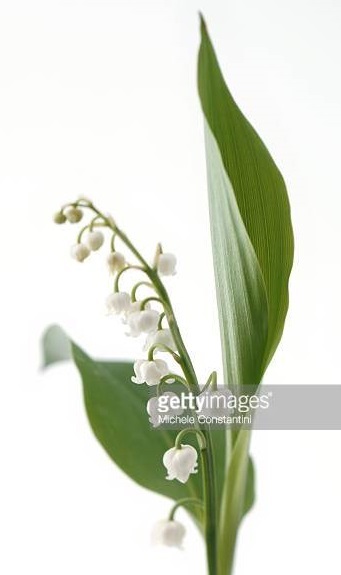 That's what kielo means in Finnish, lily of the valley, and it's pronounced not Kee-lo as I assumed but Kye-lo. 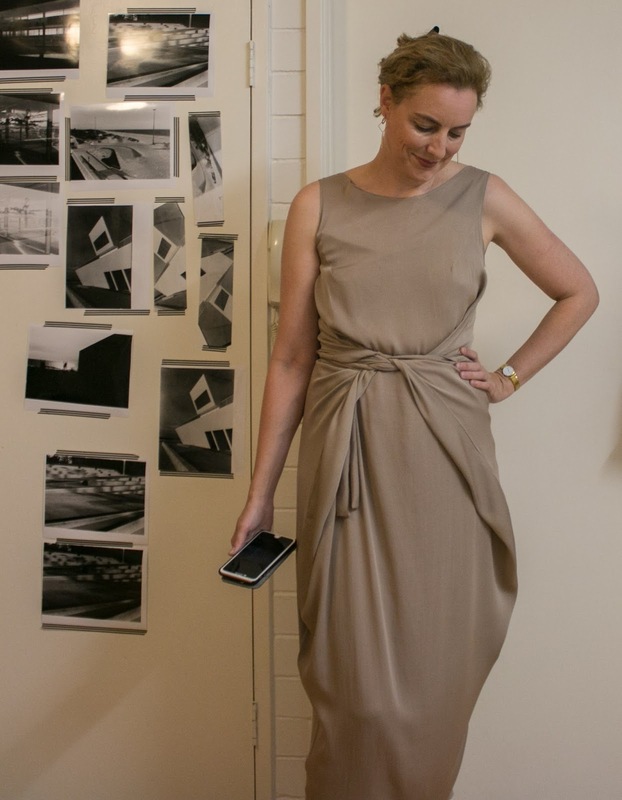 And the Kielo is also, of course, the famous among sewists wrap dress from Finnish pattern company Named Clothing. There actually is a resemblance, not in the flower itself but to the leaf and the shape of this dress. 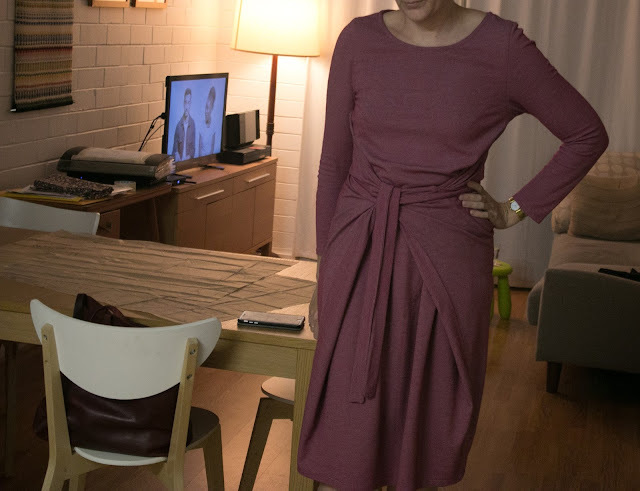 The dress above is actually my second Kielo, this knee-length, full-sleeved, 50 per cent cotton/47 per cent poly/3 per cent spandex jersey was my first, made over a year ago. Both of these dresses are the result not of planning, but serendipitous fabric finds and the good luck to have a pattern work out exactly as I hoped. I found the jersey at Spotlight last year. I wasn't looking for it, but when I touched it I found it was soft and smooth while also reasonably thick and in a glorious colour. It wasn't particularly cheap ($20 a metre) but I snapped it up and when I went to the cutting counter it was close to the end of the roll and I got the whole lot. I didn't have a plan for it, it just sat in the stash and I would pat in regularly, wondering what to do with such a large amount of fabric and wanting to make sure it was something good and eventually deciding to make a Kielo dress with the sleeve add-on. The Kielo comes together very easily, it's basically a giant t-shirt with a few darts front and back, the giant wings that fold around and the two ties. Weirdly the pattern kind of leaves it up to you to figure out how to finish the neckline, so I just cut a quick facing and sewed that on the inside. 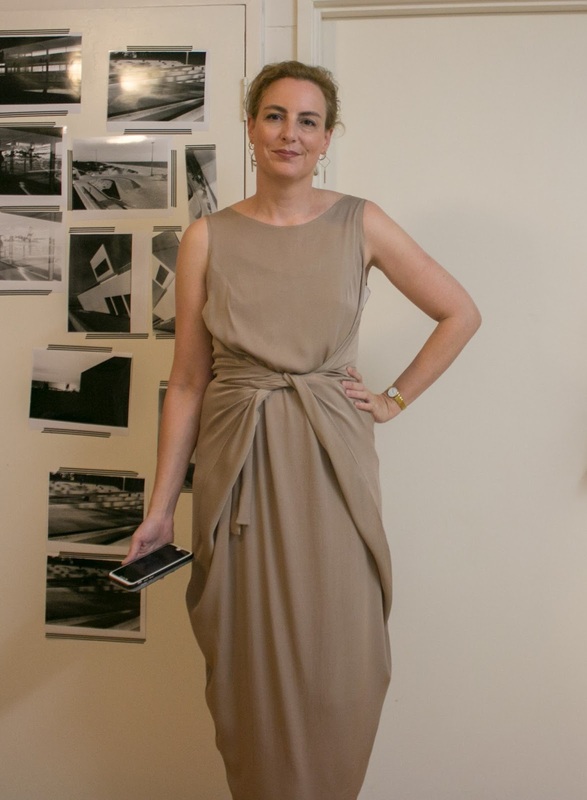 This dress is pretty comfortable to wear, although it is of course fairly bulky around the waist and also tighter at the waist that you might expect for a jersey dress. last winter and it seems to pique people's interest, especially when I unwrap the wings and show them the style. I also love the colour and one of my colleagues actually spotted it and then told me all about skin type and colour schemes (I am an autumn apparently) which led me towards doing Wardrobe Architect with a group of sewing friends and subsequently started wearing a lot more pink, teal and mustard, but that's a story for another day. So that's serendipitous Kielo number 1. The story of number 2 starts at the Morrison clothing fabric sale back in May. I only discovered them back in February but it's already one of my favourite ways to buy fabric. The fabric is the leftovers from the ready-to-wear range, so all suitable for apparel, often the kind of thing you won't find in fabric stores, the bolts are wide and it's pretty cheap - usually $5 a metre and $10 a metre for anything silk. The sales are short notice and only for a few days and of course you never know quite what they are going to have so last time I went armed with a list of project ideas and the yardage I would need for each pattern. I found some lovely matte stretchy silk and some matching shiny stretchy silk and decided to get enough for a Kielo and a slip underneath. The slinky silk wasn't very wide so I asked for three metres and the assistant looked at the roll, said "I'm happy to call that three metres" and sold me the entire roll for $30. Weeks later, I unrolled it and measured it and discovered I had in fact bought 10 metres. Winning at [sewing] life! I put the fabric away and planned to make a silky Kielo for a few formal events I knew were coming up later in the year, and then in late June my sewing group decided to do a camisole workshop with lessons on rouleau loops and I had my opportunity to make my slip. I used the pattern from McCall's 6696 and cut it full length, with a bit extra to make it knee length. The slip sewing didn't actually go very well. My rouleau straps came out nicely but when I attached them to the slip I realised they were insanely too long and had to unpick, cut and resew. The binding around the neckline refused to go on neatly, and I ended up giving up and cutting a facing a la the Ogden Cami instead, which closed the top nicely but stretched out the neckline a bit and now there is a bit of gaping. By this point I was completely fed up with wrangling the slippery, stretchy fabric and decided the slip, as an undergarment made of non-fraying fabric, would be forever unhemmed. I do not regret that decision. Then finally, the long silk Kielo. 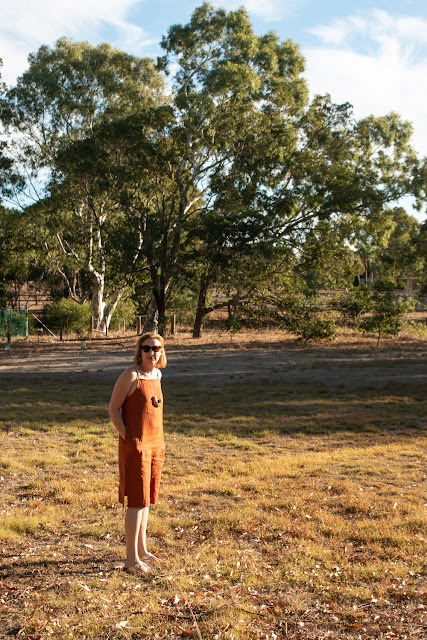 I had a deadline, I wanted to make the dress for the #PerthSewcialSoiree in late September. I don't have much to say about this - it was easy to cut out and sew and I finished it in one evening. I did make the possibly pretty silly decision to just cut it out and sew it without a plan of how I was going to finish the neck and armholes. I was worried bias strips would look too bulky with the fine silk and the all in one facing Named suggest online wouldn't have been right either. So I just started sewing with a plan to just figure it out at the end. This could have ended very badly, but in the end I just folded over a tiny hem (5mm perhaps) and top stitched long. It's not perfect but it's totally fine. The slip also gapes and shows through at the neckline, but it looks fine and I'm not bothered about it. 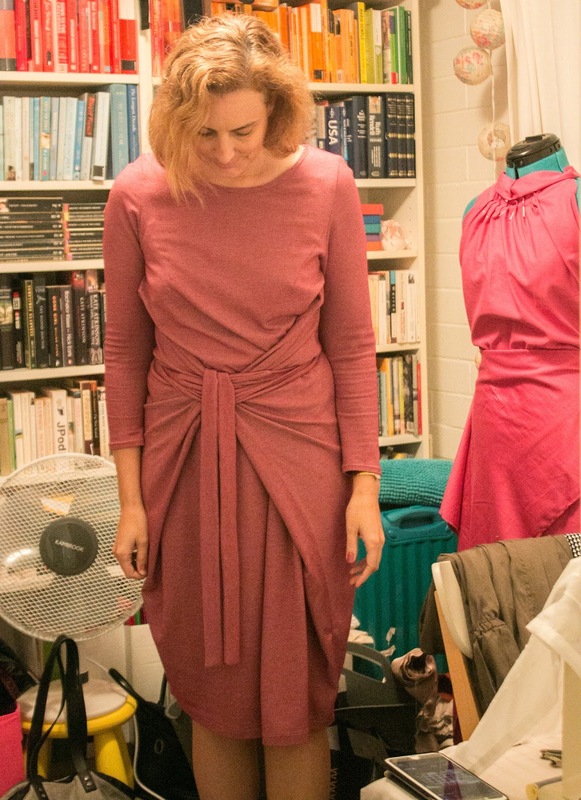 One thing that does bother me a bit, and I had a good chat with one of the women at the Sewcial Soiree who has also made the Kielo and that is the way the side seams twist around and are so visible at the front. It has to do with the back piece being pulled and wrapped to the front, and it's as thought the front piece needs to be smaller to account for the turn of cloth, but we both agreed we couldn't quite see how to adjust the pattern. I spent a lot of time wrapping and rewrapping the dress to try to get them to fold in neatly along the seam, but it's almost impossible, especially in a drapey fabric. It was actually good to meet someone who had the same problem, and we ended up deciding it wouldn't be too visible in dim, evening event light and just to let it go. All that said, I still love this dress. 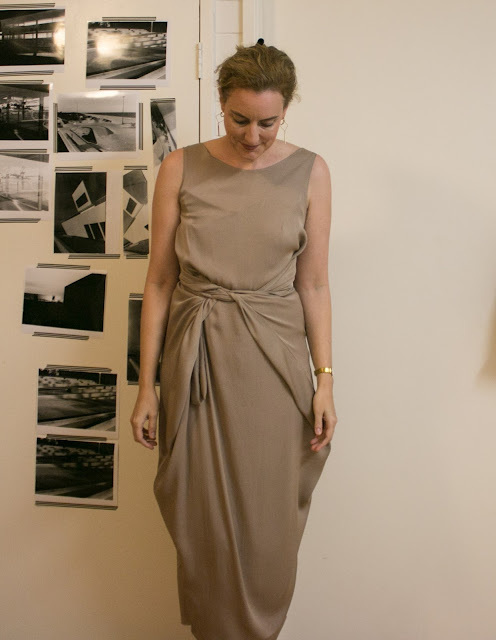 It is comfortable to wear while still looking suitably formal and I love the look and feel of the silk layers. It doesn't require super high heels which is an added bonus, I can wear casual slides and it's fine and as someone who usually ends formal events hobbling home carrying my shoes, that's pretty exciting. Both dresses are gorgeous! You will get so much water out of the pink one and the silk is stunning, and so elegant. Thanks! I love them both, especially the silk one, so lovely to wear as well.